December 17, 2014 By Sandra 3 Comments This post may contain affiliate links. Read my disclosure policy here. Special days like Christmas morning or big family gatherings call for an extra special breakfast. 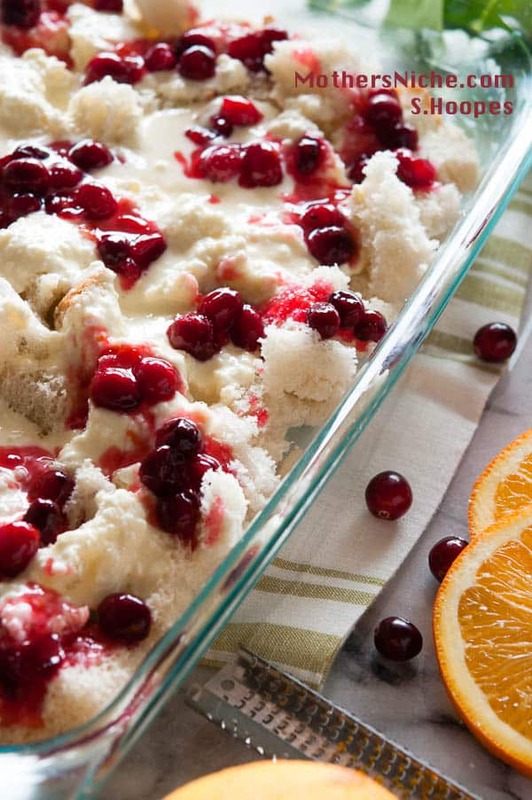 Make this Cranberry Orange French Toast Casserole Recipe the night before and you won’t be stuck in the kitchen all day. I love the idea of a warm, home baked breakfast on Christmas Day… or weekend days… or any ol’ day for that matter. The only trouble is that I don’t like getting stuck in the kitchen and missing all the fun. Or, even worse, getting stuck in the kitchen while everyone else has a chance to get all “fancied up” with their reindeer sweaters and twinkly ribbons and, well, actually get to brush their teeth before eating breakfast and tearing into the packages that Santa left. When my kids were small, all I could manage after a night of “helping Santa” was to throw a few of those “poppin’ fresh” orange cinnamon rolls from the grocery store in the oven (I do have to admit, they are pretty darned tasty). I guess that’s how orange became our favorite flavor for breakfast. Now that my kids are older, I thought it was about time to put together a breakfast that would be home baked and would allow me the time to brush my teeth and even run a comb through my hair before we dig in to see what The Big Man brought. This has been our favorite breakfast recipe for several years now. 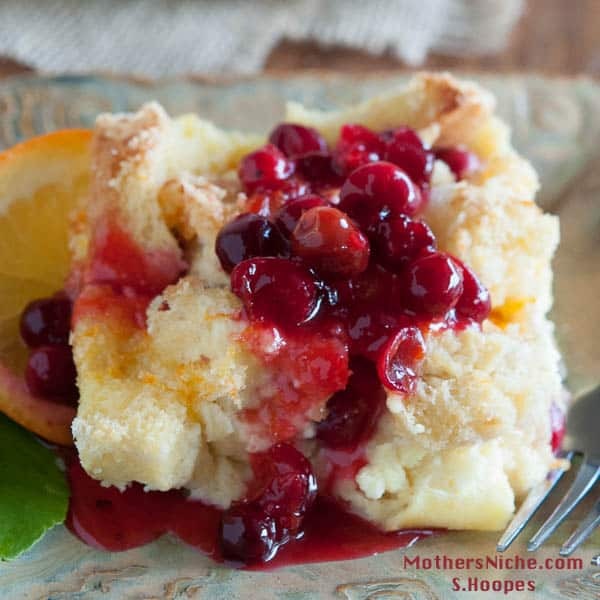 My Orange Cranberry French Toast Casserole Recipe was inspired by a favorite restaurant that we go to anytime we are in Southern California. It has the most amazing, fluffy, delicious french toast that you can imagine. Anytime we are with in 100 miles of the place, we go there just for the french toast. So, I decided to try and capture the hint of orange in their french toast and put it into my overnight breakfast recipe. I put my own spin on it with the cream cheese and Cranberry Syrup (you may certainly use blueberries, or cherries, or any other berry your family loves). The berries add a nice tartness to go with the cream cheese and egg-y custard. The cream cheese layer and orange zest topping were inspired by my good friend ,Barbara, from Barbara Bakes who makes an amazing Citrus Pull Apart Roll that you will LOVE! She mixes orange and lemon zest together in her recipe. Make the cranberry syrup several days ahead of time. Use soft French bread not sourdough or artisan bread that will be too “tangy” and tough for this recipe. Use fresh orange juice. The concentrate has an aftertaste that will get stronger when baked. Check often while it is baking to make sure it is not browning too quickly. If you have lemons, add a little bit of lemon zest to the sugar and orange zest mixture. Allow the French Toast Casserole time to “rest” before serving so that it will hold together when served. All ovens are different, so check for doneness starting at the 40 minute mark. Put this delicious French Toast Casserole in the oven and then go and join the fun! Don’t forget about this recipe the rest of the year. It is fantastic for Mother’s Day or any ol’ day. I hope you love this recipe as much as my family does. It will make a bread pudding type French toast with a slightly crunchy topping. Please feel free to use any berry that your family loves. Be sure to follow Kristina and Mother’s Niche on Facebook for all of her latest posts and, as always, you can find me at home on Everyday Southwest or on my Facebook Page. Here is the link to the Pinterest Mother’s Niche Fabulous Contributors Board so you can catch up on all of the amazing friends here at Mother’s Niche. Slice the crust from the bottom and sides of the bread leaving the soft top crust. Cut the bread into 1 inch cubes. Place ⅔ of the cubes in a buttered 9 by 13 inch dish. Beat the cream cheese, ¼ cup of the sugar, 2 tablespoons orange juice and 1 of the eggs together on medium speed until blended. Pour over the bread cubes in the dish. Spoon dabs of cranberries from the cranberry syrup randomly on top of the cream cheese mixture making sure every piece will have some of the cranberries. In a large bowl, mix the heavy cream, milk, ½ cup of the remaining sugar, vanilla, orange flavoring, salt and the remaining 8 eggs together on medium speed. Pour evenly over the bread making sure to spoon some of the mixture over the drier parts. Cover tightly and place in the refrigerator for at least one hour or overnight. 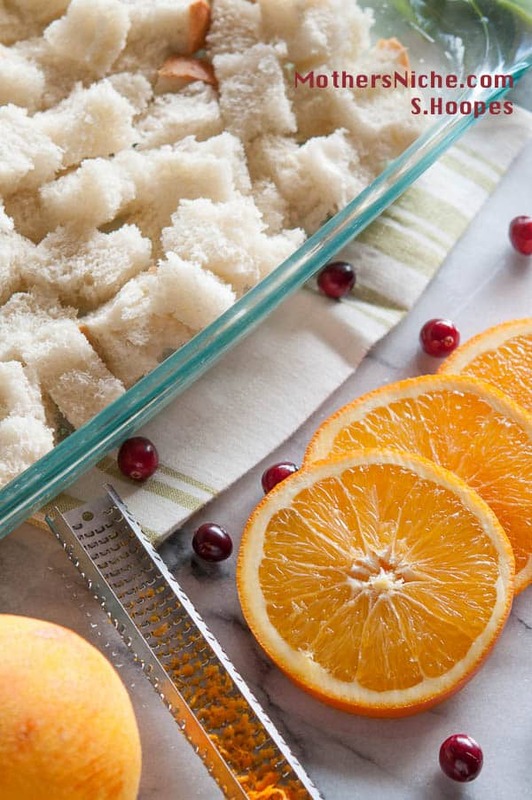 Mix the last ¾ cups sugar with the orange zest and place in the refrigerator until needed. When ready to bake, remove the french toast casserole from the refrigerator. Unwrap the dish and sprinkle the sugar and zest mixture evenly across the top. Bake for 50 to 60 minutes or until a toothpick inserted into the middle comes out clean. This will be a very soft, bread pudding type dish. 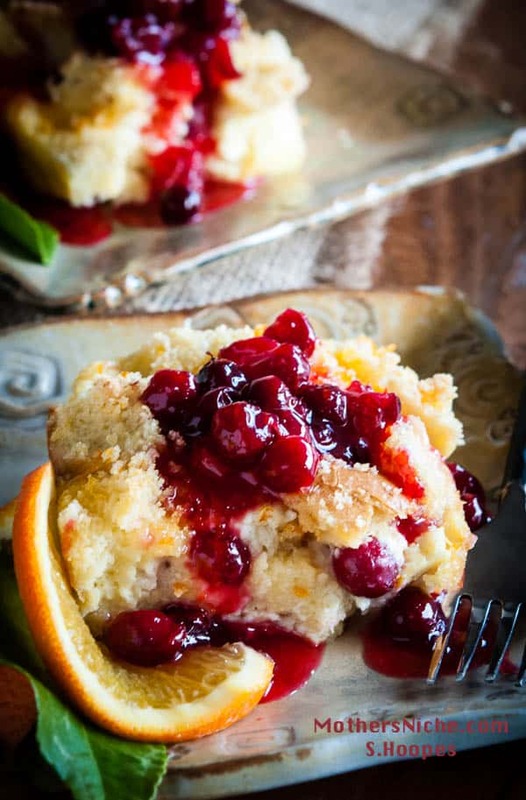 Serve with warm Cranberry Syrup, maple syrup or any other berries used in the recipe. In a small sauce pan, whisk the water, sugar, cornstarch and lemon juice together until well blended and there are no lumps in the cornstarch. Add the cranberries and place over medium heat. Bring the mixture to a boil and remove from the heat as soon as the cranberries begin to burst. Pour into a heat proof dish to cool and thicken. This looks like a heavenly breakfast. Thanks for the sweet shout out! These look tasty and great to be able to have it almost ready the night before – all helps make for an easier morning!